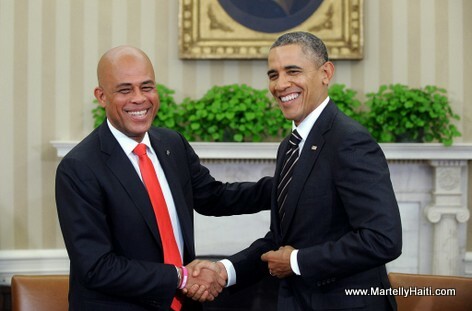 Nan kelke ane anko son onè lap ye pou mwen pou m ap pale pitit mwen de 2 mesye sa yo, Barack Obama ak Michel Martelly. Pou m ap dil mwen te gen bon lespri pou m te viv Obama (USA) 2008-2016 epi sou menm epok sa Martelly (HAITI) 2011-2016.
a) Te premye black president pou USA. b) Se li ki te retire anbago a sou CUBA. Sure, both of them are handsome, elegant presidents. They are working hard to give their country a better image in the world. All successful men are struggling with enemies who do not appreciate their effort. President Haitien Michel Martelly ak President etazini Barack Obama se de president ki pi chèlbè nan monde la. Yo tou lede gen menm pwoblem tou wi.